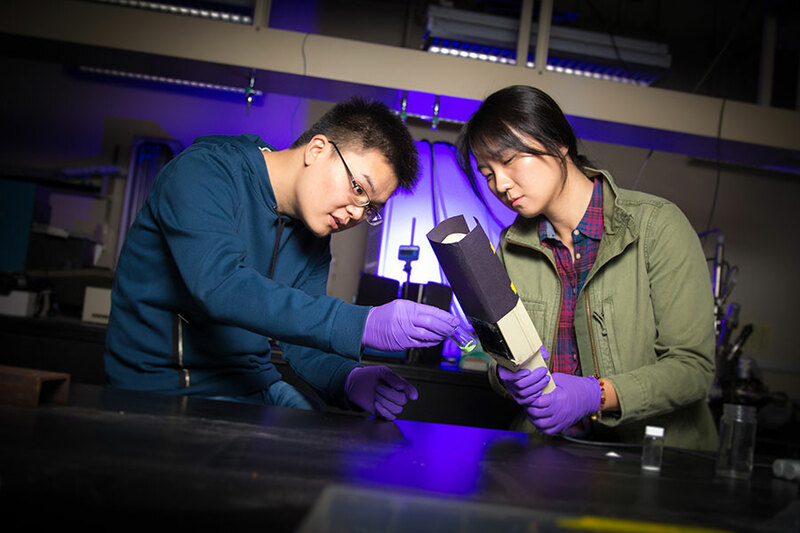 Zhenbin Wang (L) and Jungmin Ha (R) activate a newly developed phosphor by exposing it to UV light. Photo by David Baillot, UC San Diego Jacobs School of Engineering. A team led by engineers at the University of California San Diego has used data mining and the Comet supercomputer at the San Diego Supercomputer Center, based at UC San Diego, to discover a new phosphor material for white LEDs that is inexpensive and easy to make. As reported in the Feb. 19 issue of the journal Joule, the researchers built prototype white LED light bulbs using the new phosphor that exhibited better color quality than many commercial LEDs currently on the market. Researchers at UC San Diego and Chonnam National University in Korea discovered and developed a new phosphor that avoids these issues. It is made mostly of earth-abundant elements (strontium, lithium, aluminum and oxygen); it can be made using industrial methods; and it produces LEDs that render colors more vividly and accurately. Under UV light, the phosphor emits either green-yellow or blue light depending on the chemical activator that is mixed in. Photo by David Baillot, UC San Diego Jacobs School of Engineering. The new phosphor, Sr2LiAlO4 or simply SLAO, was discovered using a systematic, high-throughput computational approach developed in the lab of Shyue Ping Ong, a nanoengineering professor at the UC San Diego Jacobs School of Engineering and lead principal investigator of the study. Ong’s team used the Comet supercomputer at SDSC to predict SLAO, which is the first known material made of the elements strontium, lithium, aluminum and oxygen. Calculations also predicted this material would be stable and perform well as an LED phosphor. For example, it was predicted to absorb light in the near-UV and blue region and have high photoluminescence, which is the material’s ability to emit light when excited by a higher energy light source. "Comet resources, which are designed specifically for computations of modest scale, were especially well-suited for our project,” said Ong. “By leveraging on our open-source high-throughput software infrastructure and Comet resources, we were able to compute the stability and photoluminescent properties of thousands of candidate materials within a matter of weeks, something which would have taken years to obtain experimentally. This large dataset was then carefully mined to identify the optimal target LED phosphor for further experimental development.” Allocations to use Comet were provided by the National Science Foundation’s Extreme Science and Engineering Discovery Environment (XSEDE). Ong, who leads the Materials Virtual Lab and is a faculty member in the Sustainable Power and Energy Center at UC San Diego, uses a combination of high-throughput calculations and machine learning to discover next-generation materials for energy applications, including batteries, fuel cells and LEDs. The phosphor’s main limitation is its less than ideal quantum efficiency—how efficiently it converts incoming light to light of a different color—of about 32 percent. However, researchers note that it retains more than 88 percent of its emission at typical LED operating temperatures. In commercial LEDs, there’s usually a tradeoff with color quality, Ong noted. “But we want the best of both worlds. We have achieved excellent color quality. Now we are working on optimizing the material to improve quantum efficiency,” Ong said. Paper title: “Mining Unexplored Chemistries for Phosphors for High-Color-Quality White-Light-Emitting Diodes.” Authors of the study are Zhenbin Wang*, Jungmin Ha*, Joanna McKittrick and Shyue Ping Ong at UC San Diego; and Yoon Hwa Kim* and Won Bin Im at Chonnam National University, Republic of Korea. This work was supported by the National Science Foundation, Ceramics Program (grant 1411192). Computational resources were provided by the Triton Shared Computing Cluster at UC San Diego, the National Energy Research Scientific Computing Centre, and the Extreme Science and Engineering Discovery Environment supported by the National Science Foundation (grant ACI-1053575). This work was also supported by the Basic Science Research Program through the National Research Foundation of Korea, which is funded by the Ministry of Science and ICT (NRF-2017R1A2B3011967).